So I've updated my skincare from last year, due to finding better products that are more suited to my skin. It's kind of like trial and error with skincare, it takes a long time to find your holy grails, but if you want the perfect skin you'll keep on looking I suppose. 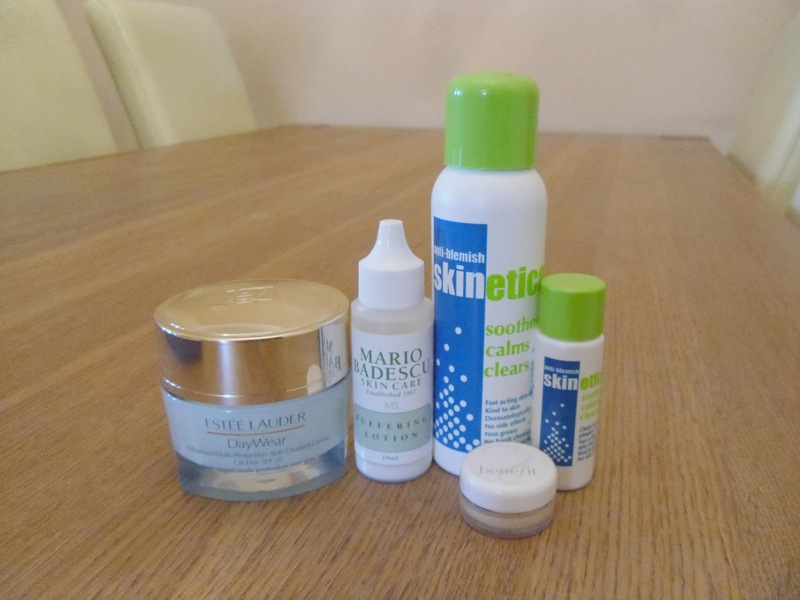 I especially like trying new products for spots/blemishes or in my words 'spot zappers'. No finer feeling than a product that reduces those horrible monsters. I've tried all sorts to try and banish mine... (sitting with my face over steaming water, sleeping with sudocreme and plasters on my face, toothepaste) we've all done it I'm sure. So here's some of my favourite skincare products listed below. This is my holy grail moisturiser and I don't think anyone will ever convert me to another moisturiser as good as this. As I have combination skin, I need something that is going to moisturise those dry areas. Now most moisturisers sink in and you can't even notice you've applied them that morning. This moisturiser leaves your skin feeling super soft and moisturised all day. I've had so many compliments about my flawless skin since using this. It makes my foundation appear so much nicer on the nice for some really. Possible the fact that my forehead doesn't look flaky anymore haha! I actually love the scent of this moisturiser as it's really fresh, it has a hint of a cucumber scent to it. Now the only thing what may put people off is the price of this product as it is retailed at £40.00 per tub, but they do last a long time and you do get 50ml of the stuff. So one of the lovely ladies at the Estee Lauder counter in French Gate gave me a sample of this serum as I wanted to try before I buy. The serum helps to even out all skintones, such as blemishes, blotches, discolourations and dark spots. I suffer with blemishes and discolorations on my face especially when I've had a bad skin week. They tend to last quite a few week unfortunately. This product has helped reduce the markings a lot quicker than usual, leaving my skin more even than usual. This makes me a very happy! I'll be treating myself to the full size after Christmas. The serum also leaves the skin with a natural glow and it smells lush. I really want to try the night repair next time. Has anyone tried either of these? This little beauty works miracles on my horrible blind, cystic spots (those god awful lumps under the skin). Now before purchasing this product I hadn't heard of it before, but once I saw it listed on 'gh0stparties' favourite skincare products I had to try it. As cycstic spots take weeks and weeks to go for me, I needed something that could speed up that process. Nobody wants lumpy skin! I can't rate this product enough honestly. It's a holy grail and will always be repurchased. Just a quick tip, make sure you shake well before using as you may see a lot of it sits at the bottom of the bottle until mixed. The product was £15.99 purchased from beautybay.com and you do only get 29ml to a bottle, but a little goes a long way. Now I've noticed Skinetica popping up everywhere lately, especially at beauty blogger events, which is good! I'd love to hear what you think of the product below. Right, so Skinetica is an anti-blemish treatment that is a 3in1, it's a spot/blemish treatmnent, toner and a base to your make-up.Yes! You can wear it under your make-up all day long. How good is that? I usually only apply skin clearing products after I've cleansed my face on a night. I think its the thought of the product mixing with my make-up that puts me off usually, but at least I don't have to worry with this one. Now I have noticed that this one does reduce my dreaded spots/blemishes when they do pop up. I use this all over my face AM and PM. Applied with a cotton wool pad, which go through me like mad! I have one bottle which holds 80ml and then a smaller sampler, which I would say is about 15ml. It's a handy little re-fill size for your handbag when you're sleeping out. If you go to their website you can receive a free 15ml sample to try before you buy. The 80ml bottles are only £9.99. I do try to stick to the same products for a good few weeks before deciding if I like them or not as some take a while to work with my skin. My skin gets use to products as well so I have to have a back up sometimes, but touching wood! I've been totally fine with all of these products for the last few weeks/months. I do tend to have breakouts, but don't we all? I blame mine on my hormones (it's a girl thing) haha! It's definitely been a lot better since sticking with these little gems though oh and taking some extra vitamins from Holland & Barretts, such as the Complete Bs. For those of you who are interested in how I remove my mak-up at the moment im still usuing the L'Oreal michellin 3in1 water solution as it's quick to do before jumping into bed. Is there any other make-up removers that you recommend? Or what's your favourite spot zapper? Do you have any holy grail skin care products? Let me know if so as I'm always willing to try new ones. Great post! I'm actually curious as to wear your purchased your L'Oreal Michellin 3 in 1 Water Solution? I'd like to try it as the makeup remover I have now is not my favorite and leaves an oily residue on my face.